Reading and share top 29 famous quotes and sayings about Cult Leaders by famous authors and people. Browse top 29 famous quotes and sayings about Cult Leaders by most favorite authors. 2. "Double standards in domestic roles are deeply rooted in cultural attitudes and workplace practices. Working mothers are held to higher standards than working fathers and are often criticized for being insufficiently committed, either as parents or professionals. Those who seem willing to sacrifice family needs to workplace demands appear lacking as mothers. Those who take extended leave or reduced schedules appear lacking as leaders." 3. "The best people in a dying culture are the outcasts considered crazy by the leaders; the ones most disillusioned with their own culture. In Yeats' phrase, "the best lack all conviction, while the worst are full of passionate intensity." Intense emotional attachment to any value, any virtue, any set of "shoulds" is a disease, a mental illness, a condition of self-murder and cultural assassination." 4. "I've made some films for the military that are teaching things like cultural awareness and leadership issues, that sort of stuff. And try to, in essence, look at what training they're doing and say, 'This is how you can improve the training from a humanistic point of view.'" 5. "Paul agonizes far more over the difficult things he has had to suffer at the hands of his own converts in Corinth than over the beatings and privations he has endured at the hands of outsiders. Thus, pastors and other Christian leaders must not be surprised by the extraordinary emotional pressures that may befall them, imposed by thoughtless or even renegade church members. These will rarely be fair; they can be soul-destroying. But from a biblical perspective, they are scarcely surprising. To expect them is to rob them of part of their power; to endure them with grace and fortitude is nothing other than following the example of Jesus." 6. "We attach to most of our chapels a cultural hall so that our youth may have a place to dance, to perform their talents in musicals and other uplifting entertainment, and we hope our youth leaders as trustees of the building will see to it that only wholesome, uplifting activities are performed in this building. Should you have any reservations whether or not an activity, a style of dancing or tempo of music is in accord with Church standards, may I suggest this guide: Does it uplift and inspire one to higher ideals? Does it develop wholesome relationships between young men and women, or appeal to and arouse their baser instincts? Will it cause one to be a better Latter-day Saint and lead one closer to the Savior? Avoid all activities and dances which bring the world's demoralizing standards into this sacred meeting place." 7. 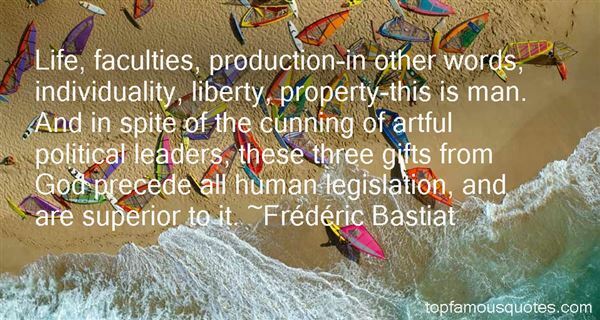 "Life, faculties, production-in other words, individuality, liberty, property-this is man. And in spite of the cunning of artful political leaders, these three gifts from God precede all human legislation, and are superior to it." 8. "Leaders dramatically influence the culture of their organizations through their own work habits. Being a leader does not mean one has 'made it' and is now exempt from hard work. Rather, leaders should set the pace for others. Few things discourage employees and volunteers any more than lazy leaders. Leaders should not ask their people to undertake tasks they are unwilling to perform themselves." 9. "So the real problem, according to Madison, was a majority faction, and here the solution was offered by the Constitution, to have "an extensive republic," that is, a large nation ranging over thirteen states, for then "it will be more difficult for all who feel it to discover their own strength, and to act in unison with each other. . . . The influence of factious leaders may kindle a flame within their particular States, but will be unable to spread a general conflagration through the other States." 10. "We have created a culture of leadership "development" in the Church at the expense of ignore the ministry of the Church to making disciples." 11. "The conductor is the artistic leader and sometimes cultural arbiter of his or her community. It is their leadership that is looked to and should anything go wrong, they are the persons taking most of the heat." 12. "I think generally the heads of terrorist groups are very, very smart people. They're also great manipulators. I would presume that cult leaders are identical. These sort of individuals are very strong, they have very strong charisma." 13. "In these difficult financial times for so many of our districts, as our local leaders strive to balance their budgets by cutting services, we would be irresponsible not to invest in the arts." 14. "Law and order is a social service. Crime and the fear which the threat of crime induces can paralyse whole communities, keep lonely and vulnerable elderly people shut up in their homes, scar young lives and raise to cult status the swaggering violent bully who achieves predatory control over the streets. I suspect that there would be more support and less criticism than today's political leaders imagine for a large shift of resources from Social Security benefits to law and order - as long as rhetoric about getting tough on crime was matched by practice." 15. "The Leadership Training Institute of America is a cultural think tank providing training and opportunity in leadership development and cultural dynamics." 16. "I have talked with many pastors whose real struggle isn't first with the hardship of ministry, the lack of appreciation and involvement of people, or difficulties with fellow leaders. No, the real struggle they are having, one that is very hard for a pastor to admit, is with God. What has caused ministry to become hard and burdensome is disappointment and anger with God." 17. "Europe is difficult to coordinate, and our main deficit may not even lie in this area of finance and economics, but in foreign and security policy. We have a leadership problem because we are still 27 different members who have still not decided on how to work with each other based on what we used to call a European constitution." 18. "Our society, our culture - the greatness of America - goes hand-in-hand with energy, and our leaders need to wake up. We need energy, OK?" 19. "The country was lumbering towards election day. Strike turned in early on Sunday and watched the day's gaffes, counterclaims and promises being tabulated on his portable TV. There was an air of joylessness in every news report he watched. The national debt was so huge that it was diffcult to comprehend. Cuts were coming, whoever won; deep, painful cuts; and sometimes, with their weasel words, the party leaders reminded Strike of the surgeons who had told him cautiously that he might experience a degree of discomfort; they who would never personally feel the pain that was about to be inflicted." 20. "Heroes are men who admit to being difficult to live with, who demand extremely high standards in every aspect of their lives, who are natural, effortless leaders, strong men, men with prestige and intelligence, whose faults are likely to be manifestations of strength and power. He is the master of his life; he is in control. Whether his sphere of influence is the boardroom or the mountains, the sea or the stage, the hero dominates it with his personality, his intelligence, and his quick, hard-honed grasp of every situation. A hero can seem arrogant and short-tempered, ruthless, tough, even cruel -- he can be quite unlovable at first." 21. "In order to cultivate a set of leaders with legitimacy in the eyes of the citizenry, it is necessary that the path to leadership be visibly open to talented and qualified individuals of every race and ethnicity." 22. "To instill the values for the culture was and is the responsibility of the leadership, and staff alignment was critical to its success. It started with both board and staff. They realized that they needed to share the same value system that says, "I am the equipper, not the doer." If not, there were going to be immense roadblocks to effectively mobilizing people for ministry." 23. "When an attack on home soil causes cultural paroxysms that have nothing to do with the attack, when we respond to real threats to our nation by distrusting ourselves with imagined threats to femininity and family life, when we invest our leaders with a cartoon masculinity and require of them bluster in lieu of a capacity for rational calculation, and when we blame our frailty in 'fifth column' feminists - in short, when we base our security on a mythical male strength that can only increase itself against a mythical female weakness - we should know that we are exhibiting the symptoms of a lethal, albeit curable, cultural affliction (p. 295)." 24. "If readers, young and old, would take even a moment to reflect on our rapidly shifting culture and ideology, I would be happy. Many leaders of the older generation dismiss emerging culture. Those leaders are at risk of becoming a feeble voice-piece without followers. Most of the younger generation is going deaf to the truth." 25. "I think in national security, the war in Iraq is troublesome and a difficult challenge, but our troops and the military leaders we have are managing that situation, although it continues to be very risky and very dangerous." 26. "Strategy has no value if your culture and leadership mindset are wrong"
27. "I work hard to stay cynical enough! 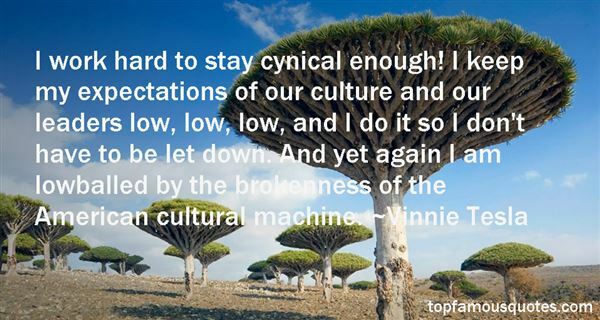 I keep my expectations of our culture and our leaders low, low, low, and I do it so I don't have to be let down. And yet again I am lowballed by the brokenness of the American cultural machine." 28. "In their time of crisis, instead of turning to God for wisdom, the people consulted demons (Isa. 8:19; Deut. 18:10–12), and this only increased their moral and spiritual darkness. The increase of the occult in our own day is evidence that people are deliberately rejecting God's Word and turning to Satan's lies. "If they do not speak according to this word, they have no light of dawn" (Isa. 8:20 NIV). Judah's leaders anxiously looked for the dawning of a new day, but they saw only a deepening darkness. God's Word is our only dependable light in this world's darkness (Ps. 119:105; 2 Peter 1:19–21)." 29. 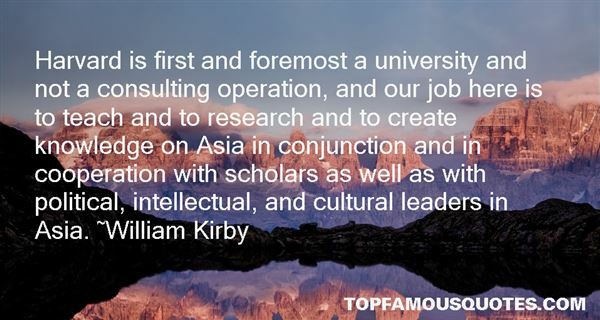 "Harvard is first and foremost a university and not a consulting operation, and our job here is to teach and to research and to create knowledge on Asia in conjunction and in cooperation with scholars as well as with political, intellectual, and cultural leaders in Asia." Books are challenging and inspirational to me."